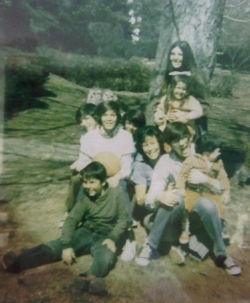 My siblings, mom and I from the bottom to the top, left to right: Howard (front row); Larry (holding the basketball), our mom (Jeanette Axelrod), Danny, and Nelson (the baby on Danny’s knee); Michael (behind Larry to his left) and Kenny (behind Larry to his right); me (with the bow in my hair), and Barbara (holding me). I was 5 when Kenny started high school and 8 when he graduated. I grew up the second to youngest of eight children. Two of my older brothers, Kenny and Howard, are slow-learners. My mother spent years lobbying the local school board, first to provide Special Education classes so my brothers could each get a high school education. At the time, there were no local high school classes for slow-learning children. After junior high school, the kids were turned away from area schools without any further education or vocational training. They were taught no skills to make them productive. They were relegated to being dependent on others — on governmental assistance programs or their families — for the rest of their lives. In my house, where Kenny and Howard had 3 older siblings, each a year and a half older than the next, if they hadn’t gone to school, they would’ve watched their older siblings … get ready for school, take the bus, make friends in school, bring their friends over, go out with them, participate in sports teams, etc., etc., etc. It would have been unbelievably cruel. My mom fought the school board to create Special Education classes, and won. The classes were then established, but my brother Kenny (the first of the two boys to go to high school) and his fellow Special Education classmates were put on segregated, handicapped busses and in segregated gym classes. Imagine what that was like. This was the first Special Education class. They were already going to face snide remarks from other kids. To this day, the word “retard” is used as if it’s not offensive, discriminatory speech. Now they had to face waiting for a separate bus, and coming to school in the bus that was designed for children with physical handicaps, whereas they had none. My mom returned to the school board to lobby for integrated busses and gym classes. She won those fights, too, but her work was not done. As graduation approached for Kenny and the first class of Special Education students, the school board advised that they would not walk in caps and gowns with the rest of their class at graduation. They would not receive diplomas. They had passed all their classes. Their older siblings had walked in caps and gowns at graduation, and received diplomas. All the other kids in school would, too, but them. My mom fought that decision, too. I can still remember her rehearsing her speech. “What colleges and universities do you imagine my boys will get into,” she asked, “that they will deny spots to your children? How would you feel if all the other kids your age could walk down the aisle at graduation, and you couldn’t? How would you feel if your siblings could? Think of the message you are sending these kids. Why should they work hard, study, take their training seriously, and pass their classes, if you are going to deny them this? You are telling them their studies are worthless.” The school board relented. The Special Education students participated in the graduation ceremony along with the other children, and received diplomas. The district is now one of the preeminent providers in the region of not only Special Education classes, but of various other types of classes for special needs kids. Kenny and Howard both graduated from high school. During high school, my father spent months working with Kenny to make sure he learned the Driver’s Manual so he could become independent. My dad would go over a short paragraph of the manual with Kenny every night at the dinner table, reviewing each previous paragraph with him that they had studied before, until Kenny learned the whole manual. Kenny is now a terrific driver. He uses the skill in his job as a professional courier. My dad later worked with Howard to make sure he could drive, too, and he does. Both boys grew up to be hard working, tax paying adults who contribute to society, but their story does not end there. My siblings and I have had to constantly fight to ensure their fair treatment against those who would discriminate against them, or take advantage of them. Having slow-learning siblings is a constant reminder of the importance of the struggle for diversity and inclusion.